Ignition Casino Poker welcomes players from the United States. Not every poker site or online gaming option is going to have an illustrious history or experience dating back to the dial-up days of the Internet. There are many modern poker sites and this is a good thing because these sites are more likely to offer fast and exciting poker options that engage with people in the way that they want to play. This is definitely the case with Ignition Casino Poker, a site that aims to provide players with adrenaline-fuelled fast poker play and plenty of bonuses. One way in which the site is showing itself to be a modern and progressive poker site is through its acceptance of Bitcoin as currency. This is a digital currency that is becoming increasingly popular so knowing that there is a reliable poker site for players who wish to utilize Bitcoin is a great starting point for most players. There may not be too many Bitcoin poker sites to choose from at the moment but the numbers are growing. It would be fair to say that online poker sites prosper when as many people as possible have access to a site. There is a great deal to be said for making the site open to as many people as possible and in ensuring as many people can play poker as possible. 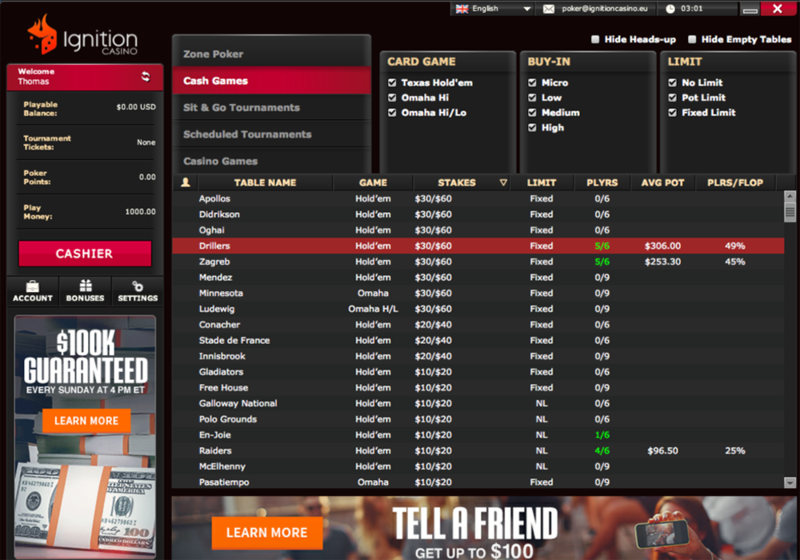 This is why it is pleasing to see that the Ignition Casino Poker site has a Mac poker option. 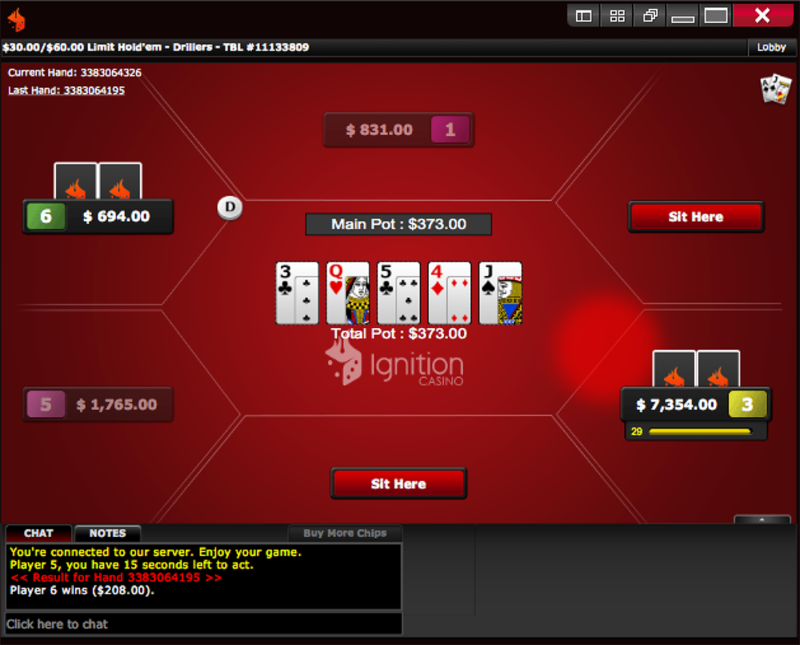 The Ignition Casino Poker site isn’t going to win awards for the flashiest looking site or the most technically advanced, but that isn’t really the point. The games look good and move well, which is all you are looking for from a Mac friendly poker site. Mac users will have no problems at all in using the Ignition Casino Poker site. As the site says, the vast majority of Macs made within the last 5 years will be able to handle the Ignition Casino Poker Mac software option with ease. When you sign up for the Ignition Casino Poker site and make your first deposit, you have the chance to earn a number of bonuses. In total, there is $2,000 in bonuses available straight away to all new players, although it should be pointed out that this is $1,000 for a casino welcome bonus and $1,000 in poker welcome bonuses. 15, 85, 185, 400, 1,000, 2,500, 5,000, 10,000. Before players are able to withdraw winnings, the deposit amount and the bonus amount has to be played through 25 times. Players on Ignition Casino Poker can also enjoy a Bitcoin bonus when they sign up and deposit in Bitcoins on site. This is a 200% matched deposit bonus that is available up to $2,000. The bonus and deposit have to be played through 25 times before any winnings can be withdrawn from the site. Ignition Casino Poker also provides a Tell-A-Friend Bonus whereas you will receive 200% (up to a value of $100) of the first deposit made by someone you refer to the site. If you’re looking for an online poker site where you and your friends can play, this is a great bonus and if used correctly, you can earn a massive bonus or make sure that all of your friends get a little extra bankroll to play with. Welcome bonuses and bonuses for your first deposit are pretty common in online poker, so it is good to see online poker sites offering bonuses for depositing regularly. The site is currently offering a 10% cash back bonus for every deposit made via rapid transfer or credit card. Not enough online poker sites do enough to encourage loyalty amongst players, solely focusing on bringing in new players, so this is a pleasing offer from Ignition Casino Poker. By now you should have realized that Ignition Casino Poker is a good option for Bitcoin poker and you’ll be pleased to hear that they offer an even better bonus for Bitcoin depositors. At this moment this bonus appears only available to casino players, but this may change at any point, so keep an eye out for new developments, but people who deposit with Bitcoin can earn a 25% matched deposit bonus up to $1,000. While there may not be too many deposit options available at the Ignition Casino Poker site, there should be enough options to have most players playing. Funds can be deposited by credit card, rapid transfer, and Bitcoin. Given that Bitcoin is a growing digital currency, it is good to see that there are Bitcoin Poker options available for players and Ignition Casino Poker takes players through the full process of depositing Bitcoin funds to their account. With credit card deposits there is a $20 minimum level (with a $50 minimum over the phone) and the minimum Bitcoin deposit amount is $20. The maximum deposit via credit card is $1,000 and the maximum Bitcoin deposit amount is $5,000. Winnings can be withdrawn from the Ignition Casino Poker site in two ways, by cheque or by Bitcoin. The minimum cheque amount is $100 and the maximum cheque withdrawal amount is $3,000. For Bitcoin users, the minimum withdrawal amount is $20 and the maximum withdrawal amount is $9,500. All players are entitled to one free withdrawal every 120 days on the Ignition Casino Poker site. However, Bitcoin users are entitled to 100% free deposits and withdrawals while there is a $75 fee per withdrawal for a debit card, rapid transfer, and cheque options. This is another reason why it makes sense to use the Bitcoin option if you can and it is a big reason why so many people refer to Ignition Casino Poker as one of the leading Bitcoin poker sites. In addition to the deposit bonuses, including Bitcoin poker deposit bonuses, there are a number of Poker promotions available on the Ignition Casino Poker promotions. Freeroll tournaments are always a great addition to a poker sites line-up and this is why this monthly event with $2,107 up for grabs on the Ignition Casino Poker site is of benefit. If you want to hone your skills without spending your own money or you want to win big without spending at all, freeroll poker tournaments are definitely the option to consider. If you have been racking up your Poker Points but don’t have a welcome bonus to redeem them for, you’ll be glad to know that you can still put these points to good use. It is possible to swap your Poker Points for tournament entry tickets, so you can make the most of your poker time and money. There are few things more demoralizing than losing a good hand but with the Bad Beat Bonus, you can at least get something back to minimize the pain and anguish of this style of defeat. It is possible to earn up to $1,000 in a Bad Beat Bonus on the Ignition Casino Poker site. Once you reach the Chrome level, you will be rewarded by a higher level of matched bonus for Bitcoin deposits (starting at 35% up to $1,000) and a casino reload bonus. As players progress up the rewards table, the Bitcoin bonus rises, they receive free poker chips, they obtain weekly cash back on losses and are entitled to free withdrawals. At the higher end of the reward table, there are birthday bonuses, prize draws and many other features that give players something back for spending a lot of time and money on the poker site. The Ignition Casino Poker for Mac site has a lot of good things going for it and the fact that it is suitable for Mac users as well as PC players make it an excellent choice for online poker players who want to play against as many people as possible.